Very many thanks to Robbie, Spike and Dave for our 50m dry dive. With many of the group having only experienced the shallower depths previously, the dry dive was an excellent opportunity for our divers to get an appreciation of the effects of deeper diving within the safe environment of the hyperbaric chamber. It was obvious from the outset the depth of knowledge that was held by the chamber staff and they ensured that the evening was both entertaining and extremely informative. We all left wanting to have a go again and would definitaley recommended other divers to book in the Midlands Diving Chamber. Thanks for a great night, please pass on my thanks to Spike and Dave to make the evening such a success. Enjoyed by all from the club, what an experience!! "Many thanks to you guys for the dry dive last night - I have done several dry dives and I think that was the most informative and enjoyable. I try to get all our trainees and new divers to visit a chamber as they learn so much about DCI,and diving medicine, and I find I always learn something new. 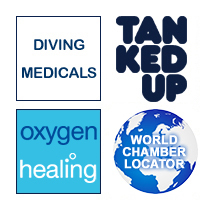 It was great that you were prepared to take the time to talk to us about how the chamber works and how divers and other medical cases are treated - much appreciated!" I just wanted to say thank you to Robbie and Spike for a great evening at the MDC! Everyone thoroughly enjoyed themselves and found it really informative. Next time can we have an harder test at the depth and an easier test at the deco stop please! I just wanted to say thank you again to you and everyone at the chamber last night. Everyone thoroughly enjoyed themselves!! Thank you and the guys so much for our dry dive. Everyone was over the moon and still talking about it now. Every element of the day surpassed our expectations. The team were spot on, the briefings very informative, the dive was hilarious when we passed 40m, all the games and compressible items added value and the t-shirts were a Brucie bonus that no one was expecting. We're making everyone who couldn't go very jealous. We all enjoyed it. Most want to have another go. Everybody had a great day out and really enjoyed themselves, thanks very much for having us! It was really informative and we wouldn't hesitate to recommend it to anybody. Thanks for the profile, we had a fantastic time & will be coming to see you again. Really enjoyed last night and great feedback all round from last night. Thank you for giving up your time to accommodate us, although hopefully we won't need you for real! Thanks again for a very informative night, everyone has said they learnt so much, even the ones that have been several time before - including me! we all had a fab evening and thank you. Wow, what a great night and we didn’t stop talking about it all the way to the curry House. It is so nice to meet and deal with such a professional outfit and it came across that you guys enjoy what you do. Thank you all for the excellent experiance, the guys and i have a briliant, informative and enjoyable day. there are all still raving about it. We did have a great time at the chamber thanks. It was good to find out how the chamber works, and to experience what happens when you are in there. It has given me more confidence with doing the deep dive for our AOWD. I hope never to have to see you in an emergency, but it is reassuring to know you are there! Thanks for a great night in the chamber again, the guys loved it and the ones that were a bit aprehensive came out with with huge smiles! The Goody bags and T shirts went down very well, thanks for the book too I really appreciate it.